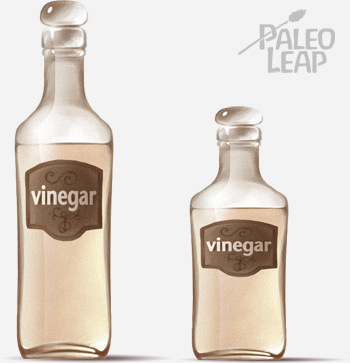 Is vinegar Paleo? Strictly speaking, it was introduced to the human diet after the Agricultural Revolution, so it wasn’t around in the Paleolithic. But that doesn’t justify an automatic rejection it just gives us reason to be cautious. A better question would be, “bearing in mind our evolutionary ancestry, is vinegar healthy?” And on close inspection, it just doesn’t seem like there’s much reason to worry about it. First of all, vinegar isn’t very far removed from a whole food. It’s really just another product of fermentation, like kimchi or sauerkraut. Unlike these other foods, vinegar can be made from anything rich in carbohydrates: grapes, apples, rice, oats, or barley, to name a few. So while it’s probably better to avoid oat and malt vinegar just to be on the safe side (although most of the gluten gets destroyed during fermentation), there are plenty of Paleo “base foods” to choose from. If you start with a food that’s Paleo-friendly and then reduce its sugar content while adding probiotic benefits through fermentation, you’ll end up with a food that’s more beneficial, not less. The research we have backs this up: although there haven’t been a lot of studies, the ones that exist are mostly positive and point to some exciting and interesting health benefits. Vinegar contains significant amounts of polyphenols, antioxidant plant chemicals responsible for many of the anti-cancer and anti-aging benefits of vegetables, but most of its virtues come from acetic acid, which is formed as a by-product of the fermentation process. The best-studied benefit of this acid is its effect on glucose metabolism, or the ability to digest starch. In one human study, approximately 4 teaspoons of white vinegar decreased glycemic response to 50 grams of carbohydrate by over 30%. Other studies with various different types of vinegar found similar effects, especially in diabetic subjects. Contrary to these findings, one 2012 study found that 4.5 teaspoons of vinegar did not alter insulin secretion or blood glucose in response to a milkshake containing 75 grams of pure glucose. Comparing their negative results to the benefits shown in previous studies, the researchers speculated that taking vinegar with a mixed meal, or with complex carbohydrates instead of pure glucose, might make the difference. Since most people eat their carbs as foods, rather than glucose shakes, this shouldn’t present a serious concern. A helping hand with carbohydrate metabolism is already good news for diabetics, but it gets even better. One study found that taking vinegar with meals improved HbA1c (a long-term measurement of average blood glucose) in diabetic patients. And a study in diabetic rats showed that balsamic vinegar improved the expression of beta-cell ABCa1, an important cholesterol transporter that also affects the insulin response. Relatedly, vinegar seems to have benefits for weight loss. One study assigned obese Japanese subjects to drink 0, 15, or 30 mL of vinegar a day, and found that in the vinegar groups, all the markers of obesity (body weight, BMI, fat area, waist circumference, and triglyceride levels) were lower than in the placebo group. Since obesity is so closely related to impaired glucose metabolism, it’s possible that this is just another effect of vinegar’s ability to increase glucose tolerance, but it may also be a separate benefit. The other potential upsides of vinegar consumption are less well documented. In hypertensive rats, either vinegar supplements or straight acetic acid supplements reduced systolic blood pressure, although these results have never been duplicated in humans. Other rat studies found improvements in blood cholesterol (higher HDL and lower triglycerides and LDL) from daily vinegar consumption. 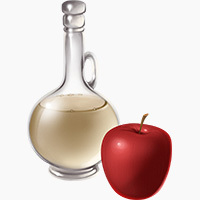 Vinegar also seems to have some anticancer properties, although laboratory tests have only been performed in rodents. The epidemiologic data for humans is conflicting: one study associated vinegar with a decrease in cancer risk, while another associated it with an increase. Another study noticed that women who ate more oil and vinegar salad dressing had better heart health, even after controlling for the obvious fact that more salad dressing implies a higher vegetable intake. Vinegar is also an old folk remedy for heartburn and acid reflux, although this has never actually been examined in a lab. However, the amount of anecdotal evidence is intriguing, and you’d definitely be hard-pressed to come up with a cheaper therapy to try. Instead of the traditional fermentation methods, industrial vinegars usually use mechanical oxygenation to speed up the fermentation process. After being allowed to ferment, they’re usually pasteurized to kill those beneficial probiotic bacteria, because they look unattractive in the bottle. Supermarket vinegars may also contain one or more additives, like caramel coloring, or sulfates and sulfites as preservatives. Fortunately, the damage isn’t as bad as it looks. Industrial processing slightly reduces the polyphenol content (less than 15% reduction). If you get pasteurized vinegar, it will also not have any probiotic benefits. On the other hand, industrial and traditional vinegars have equal amounts of acetic acid, so the most important health benefits shouldn’t be affected. Bear in mind that most of the experiments on blood sugar and other biomarkers above were done using either processed industrial vinegar or pure acetic acid, suggesting that the off-the-shelf brands are probably fine. And a comparative rat study found no real differences between traditionally and industrially produced vinegar in terms of weight control, blood lipid improvements, or prevention of fatty liver disease. The only other area of concern with grocery-store vinegar is the additives: check the additives list to make sure your brand doesn’t contain anything nasty. Few studies have examined the potential drawbacks of vinegar as a therapy, since it’s so common in food that it’s assumed to be safe. One trial in diabetic patients reported that roughly 50% of patients randomly assigned to 1 tablespoon of apple cider vinegar (1.4 grams of acetic acid) per day reported at least one negative symptom at 6 weeks; that number dropped to 10% at 12 weeks. The most common drawbacks were acid reflux events, burping, flatulence, and changes in bowel movements. The study also noted slight potential effects on urinary pH and kidney function, but concluded that further research was necessary. Another thing to note is that even when sulfates and sulfites are not added as preservatives, vinegar naturally contains these chemicals as fermentation by-products. This is why you’ll sometimes see “contains: sulfites” on the bottle even though sulfites aren’t on the ingredients label. For this reason, people who are sensitive to sulfites may do better avoiding vinegar. Other than sulfite complications, there are few documented risks of vinegar when consumed in reasonable amounts. One study recorded a woman who drank 250mL (50 teaspoons) of apple cider vinegar daily for 6 years and ended up with hypokalemia, but that just isn’t a problem relevant to most of us. The one way not to get your vinegar is from supplements. The supplement industry is so poorly regulated that it’s impossible to know how much of the active ingredient you’re really getting – or if you’re getting any at all. Stick with the real product, whether you take it dissolved in water as a kind of medicine, sprinkled over a salad, or as part of a recipe. Apple cider vinegar. This is the type of vinegar most likely to get promoted for its health benefits, because it’s the type that’s easiest to get in its traditional, unpasteurized, probiotic form. For the benefits of acetic acid, you can use any vinegar, but for the probiotics, this is your best bet. Unpasteurized apple cider vinegar is available at most supermarkets (the Bragg’s brand is the most common). Pour it on salad or coleslaw as a dressing, or sprinkle a few drops over some salted home fries: yum. Alternately, you can just add a teaspoon to a glass of water, and sweeten it with honey or whatever else you like. Balsamic vinegar. There are really two types of balsamic. The first is the traditional recipe aged for 12 years in oak casks in Italy, which most of us are unlikely to ever taste unless we can afford $100 for a bottle. The second is aged for just 3 years, which is still longer than most other types of vinegar, and probably accounts for the price difference between a $10 bottle of balsamic and a $1 bottle of white vinegar. Both are healthy, so need to panic if you can’t take out a second mortgage to buy your salad dressing. Balsamic is most popular on top of salad with some olive oil; you can also use it to perk up a bland sauce or sprinkle a little on top of some fruit for a unique twist on dessert. Red or white wine vinegar. Red vinegar is usually used to cook with. The kind you buy at the store will be processed and pasteurized, but you can also make your own, if you have a couple months before you’ll need it. White vinegar isn’t as popular for human consumption (since apple cider vinegar and balsamic both taste better to most people), but it’s a powerful antimicrobial and makes a cheap and non-toxic household cleaner for everything from windows to the kitchen sink. Macerated vinegar. If you like going a little fancier, you can buy specialty vinegars that have been infused with fruit (a process known as maceration) for extra flavor and a higher antioxidant content. Don’t be afraid of vinegar! There’s no reason to miss out on the flavor it adds to your cooking and salads, and a fair amount of evidence that it’s actually beneficial, especially for carbohydrate metabolism. Sure, it wasn’t around for Paleolithic tribesmen to sprinkle on their wild greens, but that just isn’t a compelling reason to avoid an otherwise healthy food.